“Get out of your head” is literally the worst thing you can say to me, becuase I can’t get out of my head and I don’t like to. And I literally live inside my head. Yes to almost all of this, and in particular Nos 1 and 5. Regarding 8. I do notice changes such as haircuts, but I very rarely feel like commenting on them because of all the small-talk involved. My powers of observation are seemingly variable: For instance, I noticed straight away that my boss had a hole in her cardigan, but failed to notice that a massive display board was missing. Maybe it’s because I wasn’t obliged to engage the massive display board in conversation. Exactly this! I do tend to notice details about people I’m interacting with and if I think it will bolster good relations between me and the person, I might comment on it. Otherwise, I can’t be bothered. But inanimate objects normally in my environment that have been moved or replaced often escape my notice as well! How about the “Are you serious about your schoolwork? Are you actually trying to learn the material at all?” Recently had a teacher scold me about that just cause I’ve been having trouble actually following the daily due dates for my classes. Usually have a couple days in between to break up studying, but not this semester. Also, one time, when I was in New York, a guy selling pizza in a store yelled at me that I needed to either choose a pizza slice or leave the store. I almost burst into tears. 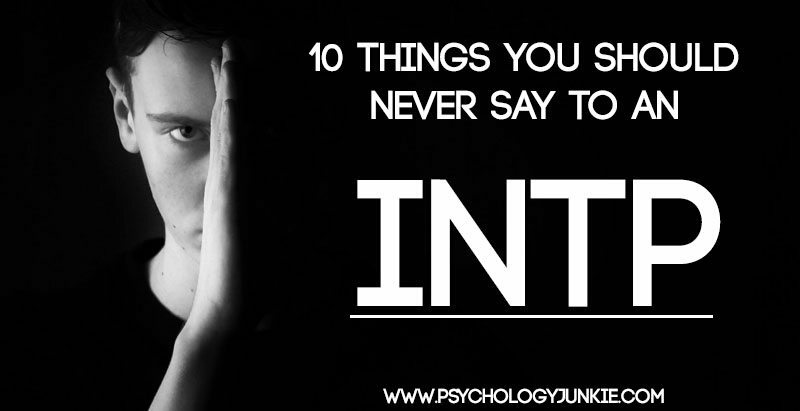 As an INTP I hate it when people try to get me to socialize. Come to the party they say, you’ll meet some great people. We don’t want to meet people because they are all boring and stupid. I am far happier being alone with my own thoughts!